AT3800 Scan Converter - The perfect device to connect any video game to a VGA monitor. 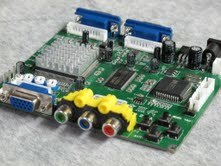 It easily and automatically converts either low (CGA) or medium (EGA) resolution outputs to a VGA signal fully compatible with all high definition LCD/LED monitors available today. The results are incredible. Breathe new life into your old Sega rear projection 50" games. You won't believe the earnings!